There are 52 Assisted Living Facilities in the Redmond area, with 9 in Redmond and 43 nearby. The average cost of assisted living in Redmond is $2,810 per month. This is lower than the national median of $3,346. To help you with your search, browse the 225 reviews below for assisted living facilities in Redmond. On average, consumers rate assisted living in Redmond 4.0 out of 5 stars. Better rated regions include Sammamish with an average rating of 5.0 out of 5 stars. Caring.com has helped thousands of families find high-quality senior care. To speak with one of our Family Advisors about assisted living options and costs in Redmond, call (855) 863-8283. Redmond, Washington, is a moderate-sized city situated northwest of Lake Sammamish. Known as the Bicycle Capital of the Northwest, Redmond is an appealing option for seniors who enjoy outdoor recreation. Redmond's senior population, 10 percent of the total population, is served by 61 assisted living facilities (ALF) in the greater Redmond area. In Redmond and across the state of Washington, ALFs are regulated by the Washington State Department of Social and Health Services. ALFs are defined by the state government as community settings that are licensed to care for seven or more residents. The Redmond area is home to world-class medical facilities, including the Swedish Redmond Campus hospital and the EvergreenHealth Emergency Department — Redmond, in the event of medical emergencies or illness. Redmond has an array of community resources for seniors, including the Redmond Senior Center, a facility with a large social hall that offers computers for senior use, a beverage bar for mingling and a greenhouse for personal use. The overall cost of living in Redmond is nearly 13 percent higher than living in nearby Seattle. Seniors who choose to live in the Redmond area will find housing costs considerably more expensive than in Seattle but will find food, utilities and health costs approximately equal to Seattle's costs. A senior has a 1 in 31 chance of being a victim of violent or property crime in Redmond. In other words, the crime rate in Redmond is 72 percent higher than in all other cities and towns across the state of Washington. These crime rates could suggest that Redmond is a less safe area for assisted living. In Redmond, seniors are able to use the One Regional Card for All (ORCA) bus pass across various public transportation services. Citizens aged 65 or older in the area are eligible to receive their first ORCA card for free. Based on the number of hazardous pollutants in the air, the National Air Toxics Assessment ranks air quality throughout the nation on a scale of 1-100 (with 100 being perfect air quality). Redmond receives an air quality score of 36, just under 25 percent worse than the national average air quality score of 58. Seniors who notice that their health conditions are aggravated by poor air quality could consider moving elsewhere in the Northwest. Assisted Living costs in Redmond start around $2,810 per month on average, while the nationwide average cost of assisted living is $4,000 per month, according to the latest figures from Genworth’s Cost of Care Survey. It’s important to note that assisted living rates in Redmond and the surrounding suburbs can vary widely based on factors such as location, the level of care needed, apartment size and the types of amenities offered at each community. 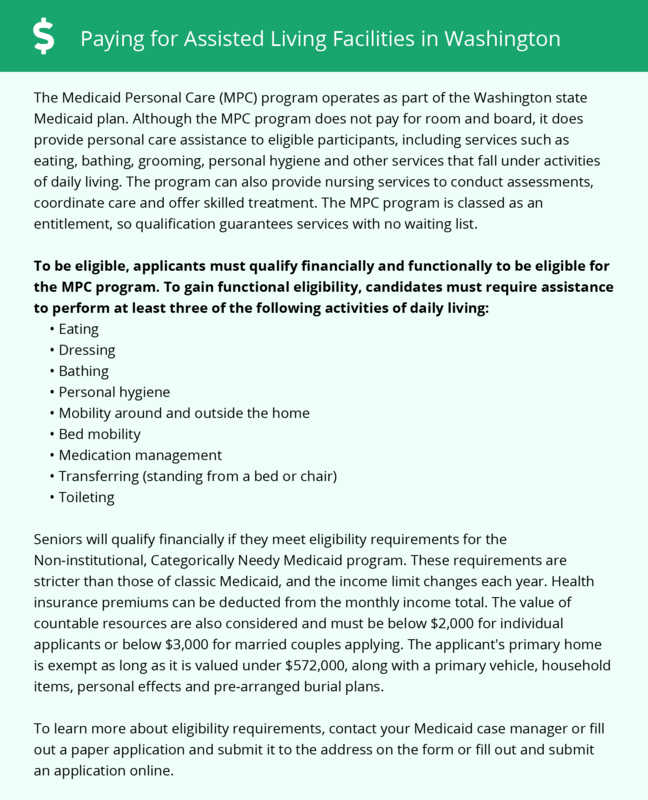 Qualifying seniors living in Redmond or throughout the state of Washington are provided with various Assisted Living Facility Service Packages that offer private rooms and occasional nursing services through Medicaid. Redmond and the surrounding area are home to numerous government agencies and non-profit organizations offering help for seniors searching for or currently residing in an assisted living community. These organizations can also provide assistance in a number of other eldercare services such as geriatric care management, elder law advice, estate planning, finding home care and health and wellness programs. To see a list of free assisted living resources in Redmond, please visit our Assisted Living in Washington page. Redmond-area assisted living communities must adhere to the comprehensive set of state laws and regulations that all assisted living communities in Washington are required to follow. Visit our Assisted Living in Washington page for more information about these laws.